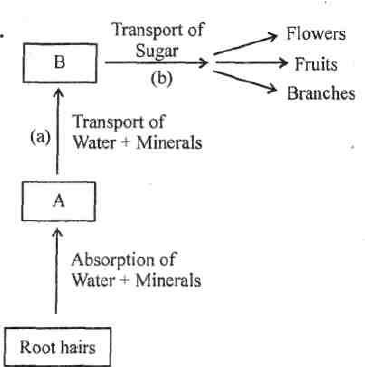 Question 1.How food and water is transported in plants? In plants food and water is transported through vascular tissue phloem and xylem. Question 2. What do you mean by meristematic region? Growth in plants is limited to certain areas like apex, internodes, which are called meristematic regions. Question 3. Site two major differences between plants and animals. Question 4. Why do animals show movement? Animals show movement in search of food, mates and shelter. Question 5. What is cambium? Cambium is lateral meristem present in root and stem which increases the girth of plant. Question 6. Why the cells of meristematic region have dense cytoplasm and prominent nuclei? Because they always remain in the stage of division and divide rapidly. Question 9. What is the role of ciliated columnar epithelium cells in respiratory tract? The cilia are hair like projections present on the outer surface of respiratory tract and their movement pushes mucus forward in the respiratory tract. Question 10. Why we can’t bend our arm like our ear? The bones of arm are composed of strong and non-flexible tissue but our ears contain highly flexible cartilage thus, we can’t bend our arm like ears. Question 11. What are the two important functions of stomata? (ii) Loss of water in the form of water vapour or transpiration. Question 12. How do desert plants prevent water loss from aerial parts? The waxy, water resistant layer cuticle present on the aerial parts helps the desert plants to prevent loss of water through transpiration. Question 13. What are the functions of parenchyma? (ii) Storage of food material. Question 14. What is the most characteristic feature of land plants which made their survival possible in terrestrial habitat? Presence of vascular tissues xylem and phloem which helps in conduction of water and food respectively is the characteristic feature of land plants. Question 15. How do water reaches to leaves and other parts in tallest plants Sequoia gigantia (Red wood tree)? Answer. Xylem vessels and tracheids help in conduction of water upto the leaves and other parts of Redwood tree. Question 16.How do animals move? A functional combination of nervous tissue and muscular tissue help in the movement of animals. In response to a stimulus the nerve impulse travels up to neurons which give instructions to the related body part (muscular tissue) in the form of impulse and the body part shows movement. Question 18. Why do blood appears red? How oxygen is carried out by it? Blood appears red due to presence of a red coloured pigment called hemoglobin. Hemoglobin combines with oxygen to form a stable compound oxyhemoglobin which is carried to different parts of the body. Thus oxygen reaches to the various tissues of the body through blood. Question 19. A brain injury is considered more critical case than injury in any other body part. Why? All the cells of our body could divide and regenerate. So, in case of any injury the cells regenerate and repair themselves and thereby body parts. But nerve cells or neurons lack the power of regeneration. So, brain injury is considered more critical than any other injury. (iii) Name the process by which B forms sugar. Question 21. What are the main functions of RBCs (erythrocytes), WBCs (leucocyte) and blood platelets? (i) RBCs – To carry oxygen to various tissues of the body. (ii) WBCs – Producing antibodies to fight antigens produced by germs. Platelets – Helps in coagulation of blood during injury. Question 22. What is differentiation’? The cells formed by meristematic tissue in plants lose the ability to divide and take up specific role and form permanent tissue. This process of taking up a permanent shape, size and function is called differentiation. Questiom 23. How parenchyma is different from collenchyma ? (i) Parenchymatous cells are loosely packed with large intercellular: .paces between them but collenchymatous cells have little intercellular spaces. (ii) Parenchymatous cells lack thickenings a corners while collenchymatous cells have thickenings of pectin and cellulose ax corners. Question 24. How the bark of the tree is formed? As the plant grows old, the epidermal cells are replaced by secondary meristem. This secondary meristem cuts off cells towards outside to form thick cork which is composed of dead, compact and arranged cells without intercellular spaces and deposition of suberin in their walls. This layer is called bark of the tree. Question 1. What is tissue? A group of cells with similar structure and function is called tissue. Question 2. Coconut fiber is composed of which kind of tissue? Question 3. The unit of nervous tissue are? Question 4. Name the blood cells that do not have nucleus? Red blood cells and platelets. Question 5. The seed coat of nuts is composed of which kind of tissue? Question 6. Name the longest cell of animals? Question 7. Name the muscle which works throughout the life? Question 8. Why do meristematic cells have prominent nuclei? Because they have to divide rapidly. Question 9. Name the tissue present in leafstalks which helps in bending. Question 10. Bottle cork or cork of commerce is obtained from which plant? Cork is obtained from Quercus suber plant. Question 11. The protective, water proof layer present in desert plants is called? Question 12. Name the tissue which helps in conduction of water? Question 13. Presence of which tissue enables us to fold our ears? Question 14. Where are fats stored in our body? In our body fats are stored below epidermal layer. Question 15. Mouth watering on seeing tasty food is voluntary or involuntary response? Question 16. Small openings present in the epidermis of leaves and stems is called? Question 17. Name the substance present in pear fruit which is responsible for its hard grit. Question 18. Name the blood corpuscles which helps in clotting of blood after any injury. Question 19. The cells of which tissue could not be repaired after injury? Question 20. The dead layer of skin is composed of which type of cells?